Readers of The Washington Post’s Metro section are familiar with John Kelly. As a local columnist, his shtick is “The Answer Man.” Through the years. Kelly has gotten all kinds of questions, including one about the origin of the name for Gallows Road. The question has also popped up the "Fairfax Underground" website. About five miles long, Gallows Road runs from Annandale, passes through Merrifield and Dunn Loring and ends in Tysons. This is what we might call “sounds right” history. From 1742 to 1752, Fairfax County’s Courthouse was located in what became Tyson’s Crossroads. Thus many folks have thought the name of Gallows Road has to do with the hangings that might have taken place at the courthouse. Kelly provides a link to research done by Eleanor Herman, a McLean-based author. As far as we can tell, she is the only person who dug deep in the county records. Her research, crippled by the loss of some records, suggests we may never know the true story. We certainly have no insight into this mystery, but when we took a look at Beth Mitchell’s Interpretive Map of Fairfax County in 1760, we could see a road running southward from where the old courthouse was located. The northernmost part appears to have been the forerunner of Gallows Road. So here is our best guess as to its track. This road in today’s terms is Gallows, Annandale and then Backlick. Note that the mile or so portion of Gallows Road from Columbia Pike to Annandale Road is also on Mitchell’s map. A triangle is formed north of Annandale. This situation is explained by G.M. 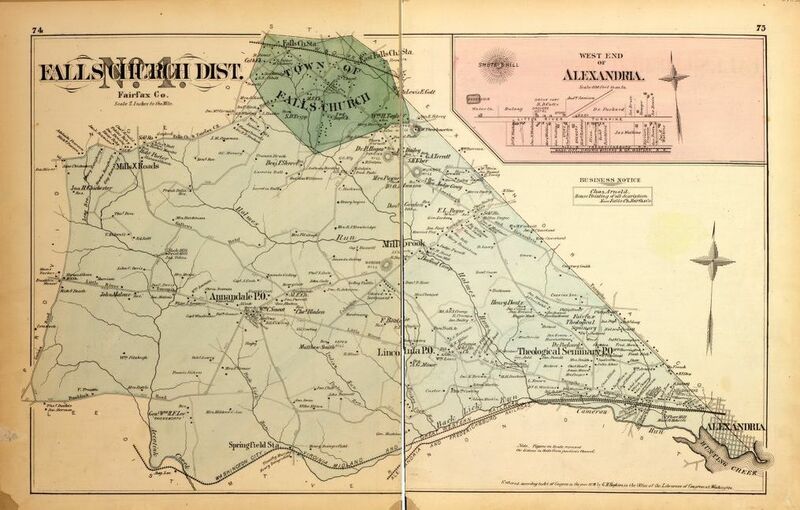 Hopkins Map of 1878 and perhaps answers a question folks in Annandale have had for many years. Why does Gallows Road change names to Annandale Road and then goes back to being called Gallows Road? October is National Book Month. I have been reading “Virginia’s Remarkable Women” by Emilee Hines. The first two chapters I read were about Anne Newport Royall and Ellen Glasgow. Both picked up ink pens, overcame obstacles and forged a remarkable career. Both these women were pioneers. Royall penned a half dozen travel books before becoming the publisher of two newspapers in Washington. Elizabeth Timothy and a few others came before her, but Royall published The Paul Pry from 1831 to 1836, and then The Huntress from 1836 to 1854. Both Royall and Glasgow turned away from the conformity of their day, including the pressure to write light novels instead of hard truths. Born in Richmond, Glasgow (1873-1945) battled with depression. Like Royall, she lived in a world where women had to fight hard just to get to what resembled a level playing field. She published twenty books, including seven novels. “In This Our Life” won the Pulitzer Prize for Fiction in 1942 and was adapted for film. These two women had something very powerful in common. They were driven by a desire to read. Royall read from her husband’s library, which included titles by Shakespeare and Voltaire. Glasgow listened to her father read to her and then was given a subscription from a library. Research on reading shows many benefits including positive cognitive stimulation, increased emotional intelligence, and reduced stress. Reading can also help launch careers. After arriving late to the party this year, crisp and sunny autumn weather has finally taken a firm grip on our region. Needing to fully immerse ourselves in the feeling, we headed to the mountains today to take in the Graves Mountain Apple Festival in Syria, Virginia. The leaves are still weeks from peak, but the drive from Culpepper to Syria was scenic. As you make your way upward, the Old Blue Ridge Turnpike hugs the Rose River. A state highway marker tells us the turnpike was completed in 1853 and ran for fifty-six miles from New Market to Gordonsville. Like the Leesburg Turnpike, the macadamized road linked the Shenandoah farms with the markets in the Piedmont. Another three miles up the road from Syria and you’re in the Shenandoah National Park. Its spine, the one-hundred mile long Skyline Drive, will draw thousands of leaf peepers in the coming weeks. Although you wouldn’t know it from the hundreds of cars in the makeshift parking lot, everything is small in these parts. The population of Madison County, about 80% the size of Fairfax County, is just 13,000. The Graves Mountain Lodge hosts the event. In a structure whose center was a log house built in late 1700s, they’ve been serving up hospitality since the 1960s. In our fast-paced world, it’s good to get away from it all and enjoy old-time experiences like these. Going to the mountains in the fall makes the feelings all the more special.